We provide fly fishing lessons for complete beginners and corrective courses for anglers who haven't quite perfected their casting skills. 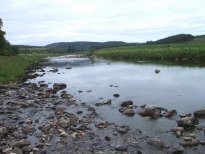 We can give you a 1 day introductory fly fishing lesson to 2 or 3 day fly fishing course which can cover tuition in both river and loch fishing, boat and bank fishing. Our fly fishing lessons take place on several locations in Perthshire, Scotland within an hours drive of Edinburgh, Glasgow or Dundee. Fly fishing is not that difficult but it is very easy to learn bad fly casting habits if you are not shown from the beginning how to cast with a fly rod correctly. Our fly fishing lessons are designed to ensure a good technique from the very start and your lessons will take place on the water and not on a blackboard. Equipment is also extremely important especially for beginners and for all of our fly fishing lessons and casting courses we provide quality, well balanced rods, reels and lines for you to learn with. If you wish to learn with your own fly fishing tackle we will check to make sure that it is well balanced and suitable for you to cast with. It is almost impossible to learn fly fishing if your rod, reel and lines are not compatible. 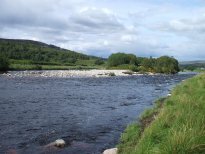 Learning how to cast is just the beginning our fly fishing courses will also teach you which trout rod is best suited for loch fishing or river fishing. How to choose a trout fishing rod and compatible reel for the first time. Which fly lines to choose to suit the the weight of your rod and which lines you would use depending on the conditions. 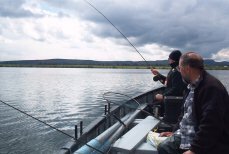 We will also teach you how to set your rod up, how to tie up a cast of flies and which flies to use at different times of the year for loch fishing or river fishing. Our one day trout, fly fishing course is designed to give you a basic introduction on fly fishing and how to cast with a fly rod correctly, for the more experienced fisherman, diagnose casting faults and correct bad casting habits. Our 2 day or 3 day trout, fly fishing courses will cover everything in more depth and will give you plenty of time to perfect your casting. Your fly fishing lessons will be at your own pace and you will find our instructors have immeasurable patience and a great sense of humour. Our Prices are �195.00 per day for a single angler or �295.00 per day for two anglers. Please email us for prices for 3 or more people. This will include a professional trout fishing guide and casting instructor exclusive to you or your party, fishing permits, boat hire (for loch fishing) and all of the fishing tackle required including well balanced rods, reels and lines, safety vests and a comprehensive selection of hand tied flies to match the time of year and the water conditions on the day. Please let us know any preferred dates if you wish to check availability. Gift vouchers are available for any of our packages. We can also arrange airport transfers from Edinburgh Airport and advise on local accommodation providers if you are joining us for 2 or more days.